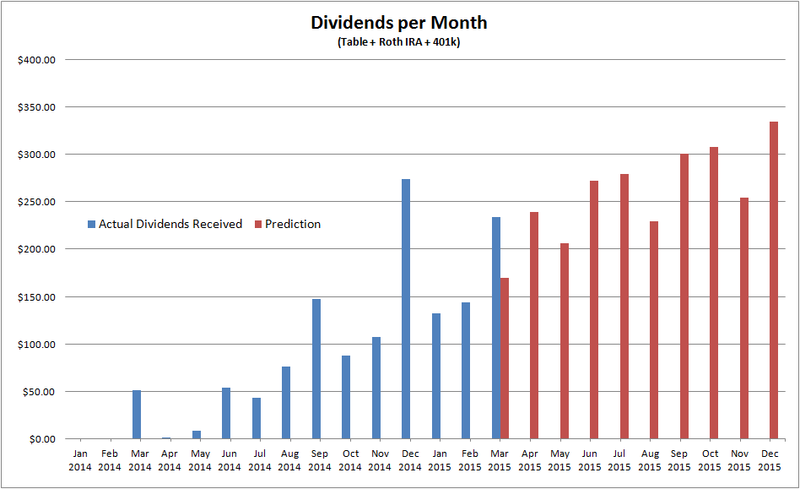 March was a good month for dividends. I have exceeded my original goal by 37%. My dividends are usually higher in the 3, 6, 9, 12 months since a lot of my stocks pay during this time. Last December, my dividends was higher because my 401k had a large allocation in Vanguard index funds which had quarterly distributions on December. Since all my equities are allocated on individual stocks, distributions should be more consistent going forward. At this point, the dividends received this month can cover all of my food expenses for the month. My dividends are set to reinvest automatically so all of the stocks that paid this month had additional shares added.